23rd May 1944: “Mein Führer, of course, even a child can see that it’s a fighter, not a bomber!” Generalluftzeugmeister Erhard Milch lost his nerve after a blistering dressing down by Adolf Hitler—and afterwards his position as well. Therefore, instead of following the usual Luftwaffe prescription of extensive preliminary testing to iron out a new model’s teething problems before going into full-scale production, Galland urged that the first 100 aircraft be tested and fine-tuned on operations. Although that of course entailed risks with the potential for casualties in accidents which would otherwise have been avoidable, failure to begin full-scale production quickly would exact a far higher toll on his fighter pilots, since the losses of his men in air combat at the time would continue undiminished due to the imbalance between the sides, which then remained both technical and numerical. Reichsmarschall Göring was impressed by Galland’s enthusiasm and promised to obtain the necessary permission for the large-scale production of the jet fighter, something which would be little more than a formality. Knowing the situation in the air, Galland was in no doubt that Göring would receive such permission. Nevertheless, there was one man in Germany who was firmly convinced that his “genius as a commander” put him head and shoulders above all other so-called military experts. His expertise had indeed to some extent been acquired in remarkable detail. However, he applied it so subjectively and increasingly as a result of wishful thinking that he grossly overrated his own ability. But at the time his word was law in Germany. On 26th November 1943, when Hitler was given a demonstration of the new jet’s capabilities, he spontaneously, although perhaps not surprisingly, put to Hermann Goring what was probably the inevitable question: “Can this aircraft carry bombs?” Göring had discussed that very point previously with the designer and, therefore, allowed Willy Messerschmitt to answer. As far as Hitler was concerned this was the end of the matter. He expected his wishes to be carried out and the Me 262 to be modified into its role of a “revenge bolt bomber”: a role for which the aircraft was totally unsuitable. The bomb load robbed the Me 262 completely of its decisive speed advantage, and it was, therefore, vulnerable to an air attack. Even with bombs on board it would still be too fast for accurate bomb aiming, especially so since the pilot was seated over the wings and at altitude had virtually no sight of ground targets. In descending approach angle, —let alone a dive—the maximum permissible speed would be exceeded in an instant. The jet would then be uncontrollable and sooner or later the wings would tear away. As for low level flight, they might as well tow a fuel tanker behind it for the quantity of fuel the jet fighter would expend while so doing. Generalluftzeugmeister Erhard Milch lost his nerve after a blistering dressing down by Adolf Hitler—and afterwards his position as well. The Luftwaffe’s most urgent number one priority at this time was for a superior fighter with which to recapture the lost air supremacy over Germany. The German piston-engined equipped fighter units were fighting desperate battles against a local twenty-fold enemy air superiority, and overall the disparity was even greater. They did so, moreover, with pilots who were being fast-tracked in a training process which was becoming less and less adequate, since there were fewer and fewer instructors available, and less and less fuel for training flights. They fought tenaciously, but many failed to survive even their maiden mission. The more experienced fighters flew tirelessly, but their numbers were dwindling. And there it was – a fighter aircraft capable of a fantastic 540 mph at 20,000 feet (19.685 ft, 870 km/h at 6.000 m altitude) – and, therefore, 95 mph (some 150 km/h) faster than the fastest allied fighter, powerfully armed and able to simply leave an enemy fighter standing, even when attacked in superior number. A burst of fire from the four 30 mm cannon would be sufficient to completely sever a four-engined Boeing B-17‘s wing, and each of the Me 262’s 24 R4M rockets (available later) could blow any enemy aircraft to smithereens with a single hit. One salvo of these rockets fired into the midst of a large bomber formation, whose aircraft would generally be flying in close formation so as to concentrate their defensive fire, had a devastating effect. The destructive outcome surpassed all expectations. There it stood – in alien guise, as a bomber! The bomber wings reluctantly had to retrain their bomber pilots to fly the Me 262, laboriously build up the complex logistics and construct expensive concrete runways in France. All this to repel the invasion! When the invasion subsequently took place, not a single “Blitzbomber” was operational. When the runways were eventually ready, they were captured by the enemy. Furthermore, the former bomber pilots were not as skilled in the tactics required for fighter against fighter air combat as their colleagues in the Jagdgeschwader (fighter wings). Thus the majority of the Me 262 losses sustained in aerial combat were assigned to the fighter bomber variants of this jet. 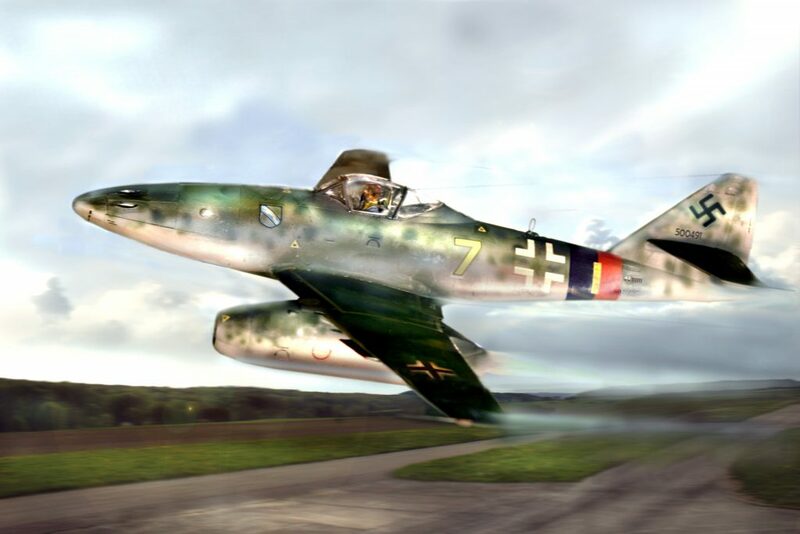 It was not until 4th November 1944 that the pressure of events forced Hitler to give the green light for full-scale production of the Me 262 as a fighter aircraft, by which time it was too late. Whether the 60 or so Me 262s, which had thus far been delivered to the bomber wings, could have turned the tide, though, is doubtful. Enemy fighters ruled the skies. They knew all about the few long, concrete runways that still remained available to the Luftwaffe for the jet fighters. 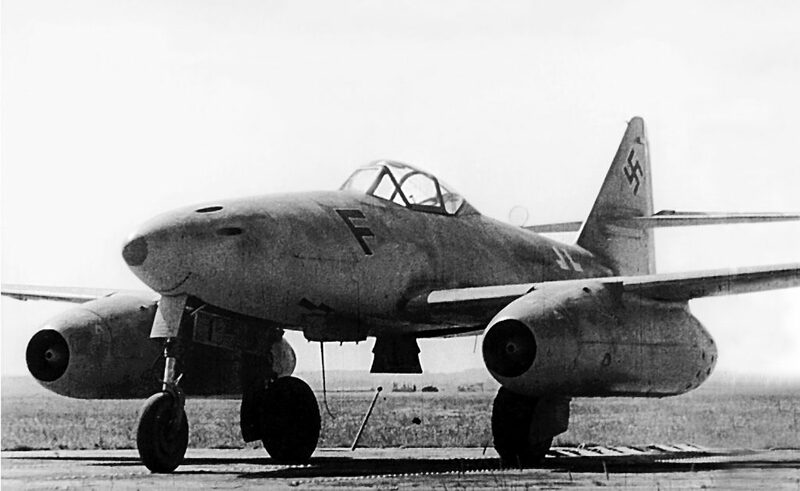 Once they were in the air, the Me 262s were almost unassailable, but they were vulnerable when taking off and landing. Gradually the American and British military staff were learning to fear this new German aircraft. What the Royal Air Force had for many years demonstrated with their predominantly wooden de Havilland “Mosquito” reconnaissance aircraft, night fighters and high-speed bombers which were all therefore light and very fast, despite conventional piston engines, was now being emulated by the German fighter pilots. The crew of a Mosquito could evade a German Messerschmitt Bf 109 G-6 or Focke-Wulf 190 A-8 with some ease simply by applying full throttle. The German fighter pilots were literally left standing with gritted teeth. But now this was once and for all a thing of the past. On the German side this aroused one final feeling of satisfaction – on the side of the Allies consternation. The jet fighters were becoming a serious threat. Also to the American bomber formations. Since the Allies could roughly predict when the “Turbos” needed to get airborne if intending to intercept a bomber stream that was coming within range, they would already be circling over the airfield with a fighter vanguard, lurking in wait for the dangerous jet fighters to take off. The Germans, for their part, attempted to counter this by employing their most up-to-date piston-engined fighters to engage the allied interceptor fighters in air combat, and keep them at bay, away from the “Turbos”. The Me 262 pilots took off into this cauldron seething directly overhead, in the gravest of danger until they had gained altitude and speed. And when they came in to land, they were never sure whether or not an allied relief formation was already waiting for them. “I am of the firm conviction, that with only 300 Messerschmitt Me 262 jet fighters we could have shot down at least 200 bombers in a single day. If we could have kept that up for one week or two weeks, they would have had to abandon daytime bombing raids on Germany. That would have minimised the immense destruction wreaked on targets in Germany.